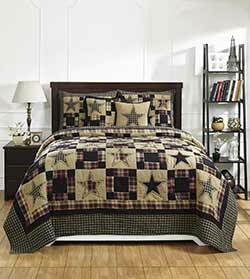 Bring the simple and charming look of the primitive style to your bedroom with the Revere quilt, featuring patchwork squares and stars in striking black and tan, with a touch of red. Bring the simple and charming look of the primitive style to your bedroom with the Revere Collection, featuring patchwork squares and stars in striking black and tan, with a touch of red. 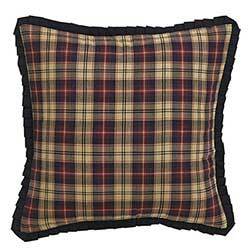 This is for the Revere Quilted Euro Sham. 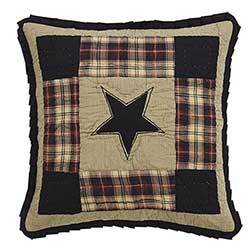 Bring the simple and charming look of the primitive style to your bedroom with the Revere quilt, featuring patchwork squares and stars in striking black and tan, with a touch of red. This is for the King size quilt set. 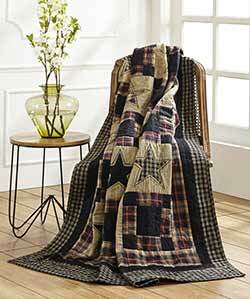 Warm up your primitive home with this patchwork quilts, featuring traditional stars and squares squares in black, tan, and a touch of red. 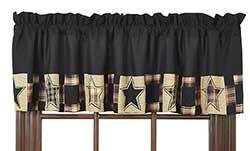 Finish the look of your primitive home with this striking window valance, featuring patchwork patches and applique stars!